When you’re involved in a car accident, it’s easy to become injured and not even be aware. One of the most common injures that people sustain during auto accidents is whiplash, a painful condition of the neck that results in symptoms that can seem unconnected to one another. At Alignment Chiropractic in Summerville, we’re able to easily recognize the symptoms of whiplash and have years of experience treating injured patients. 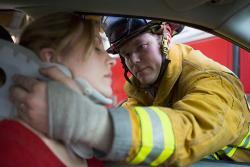 We help patients every day who need to recover from their auto injuries and are seeking relief from debilitating pain. This condition, also known as “neck strain” can negatively impact your quality of life. When you have an injury of this nature, it’s critically important to know where to turn. Chiropractic Adjustment. Chiropractic adjustments help put the vertebrae back in place and relieve pressure on the spinal cord. This reduces inflammation and pain, corrects any subluxations in the spine, improves your range of motion and helps you start the healing process. Chiropractic adjustments are safe, gentle and often enjoyable. Therapeutic Massage. Therapeutic massage relaxes the muscles, increases blood flow, reduces pain and helps improve range of motion. When paired with chiropractic adjustment, therapeutic massage is healing and also feels great. Therapeutic Exercises. Therapeutic exercises help strengthen your muscles after an injury. This prevents the muscles from becoming short and tight. In addition, therapeutic exercises can be done from home, which means that you can work on your healing from the comfort of your bedroom or living room. We'll teach you to do the proper therapeutic exercises so you can take control of your own recovery. Lifestyle advice. We'll help you make better choices at home and at work, so you can avoid further injury.